As if parenting children under five wasn’t hard enough! All those sleepless nights, countless nappy changes and incessant crying which, as soon as they figure out they can move, turns into toddler tantrums, short attention spans, constant questions and an innate ability to seek out things that can kill, harm or otherwise maim them, (stairs, sharp objects, leaping in front of moving cars and that sort of thing). 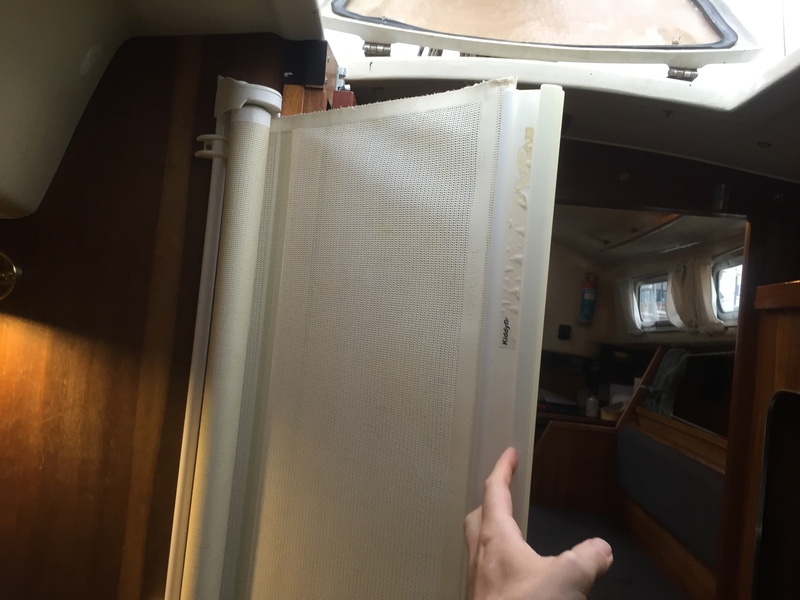 When you suggest to family members you are going to take your small children sailing on your 30 foot 1970s sailing boat on epic adventures to the last true wilderness left to man, they will normally edge towards the nearest exit whilst surreptitiously googling the number of the local social services. 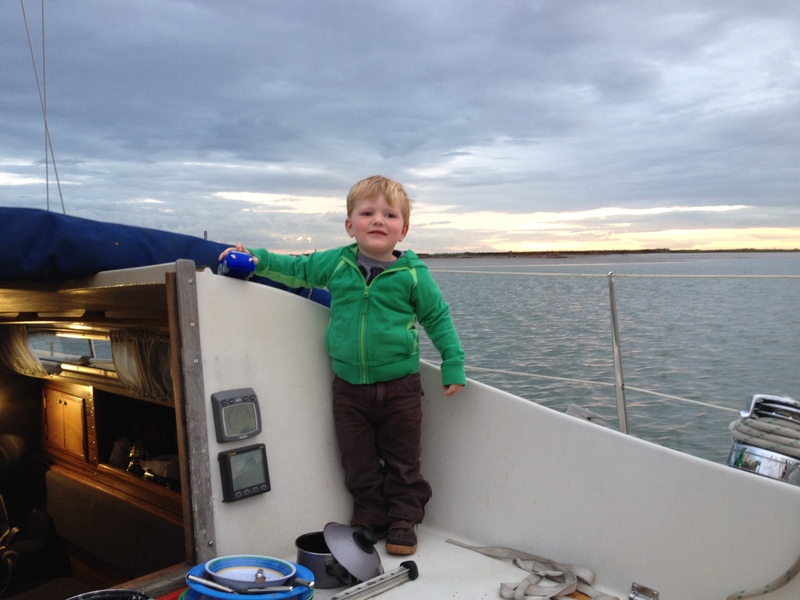 The reason I take my children sailing is the same reason we have them in the first place despite all the above. 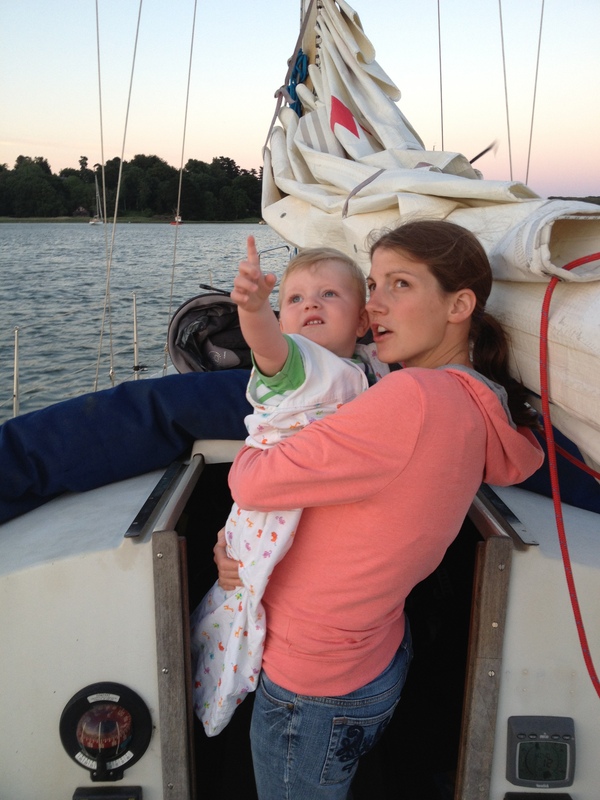 The joy and wonder Thomas (now four) and Sophie (now one) give the 1st mate (Elizabeth, my beautiful and supportive wife) and me is immeasurable and sailing is one of the few hobbies that is a truly inclusive family pursuit for young and old. Starting them so young will mean it will become second nature to them and will enable them to share in all the magical adventures (and occasional dramas/misery!) that sailing holds, as I did when I was a boy. So, how do we make this happen in a way that keeps the magic of sailing and mitigates most of the dangers for your rug rats. I stress that whilst these have worked well for us, every boat and every family is different so use any advice here at your own risk and seek manufacturers recommendations. 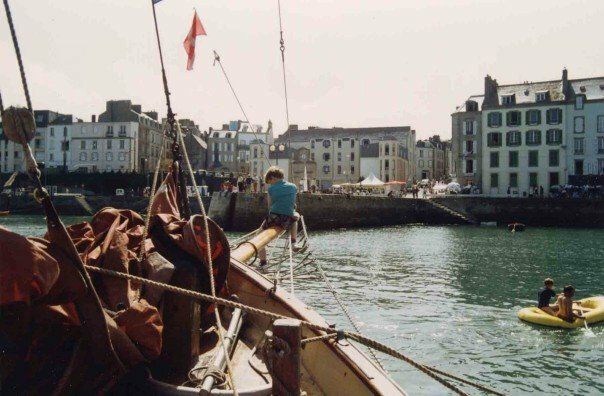 When I was young (I must be getting on if I’m resorting to that phrase), my family cruised to all sorts of exciting places and I did fall in a number of times over the years. 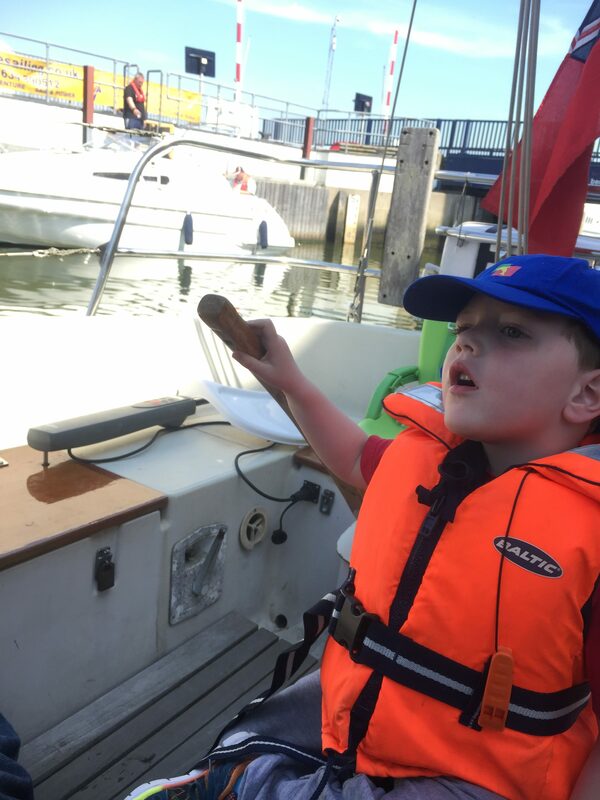 On one of those occasions when we had cruised to Holland, I can’t have been much older than Thomas is now, I had looked over my shoulder whilst walking along the pontoon to talk to my father and in doing so, I had walked straight off the edge of the pontoon into the drink! 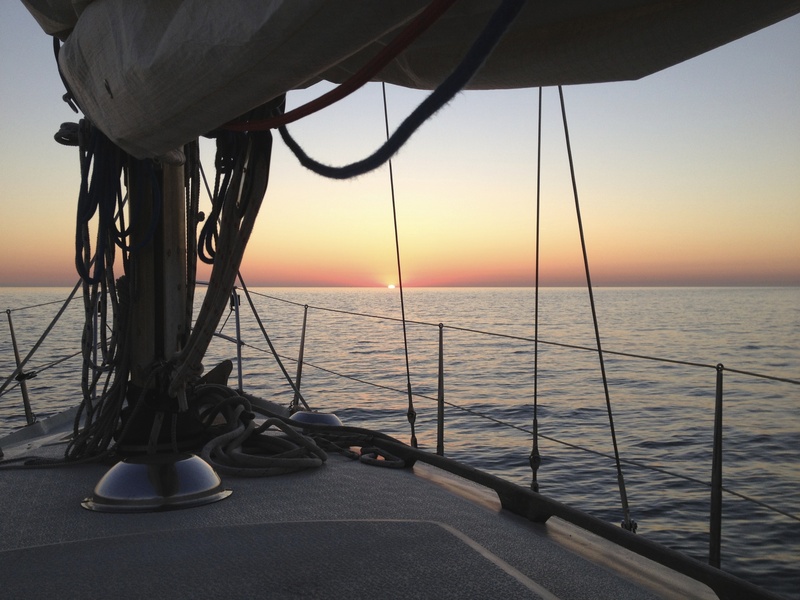 I distinctly remember bobbing to the surface (I couldn’t swim at the time and was wearing no life jacket) and seeing my mother screaming, rooted to the foredeck of our boat whist my father calming strode over and plucked me out of the water by my hair. My mother was a nervous wreck for weeks afterwards, my father, sister Juliet and myself went ashore and continued as if nothing had happened – I have some sympathy for my mother now! 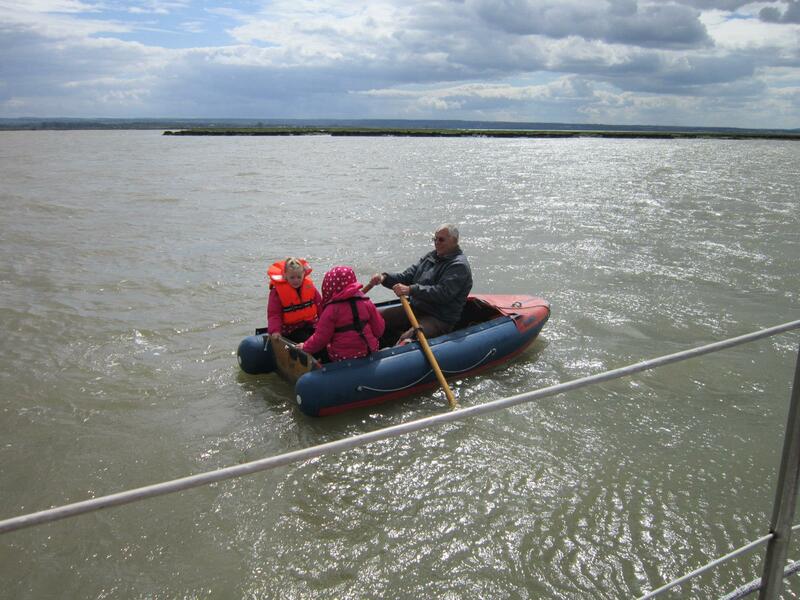 The kids falling in is my biggest concern, we try and enforce a strict life jacket policy, but in practice, there are times when they are in the cockpit with no life jackets on, or walking down the pontoons where we don’t physically have the life jackets with us. 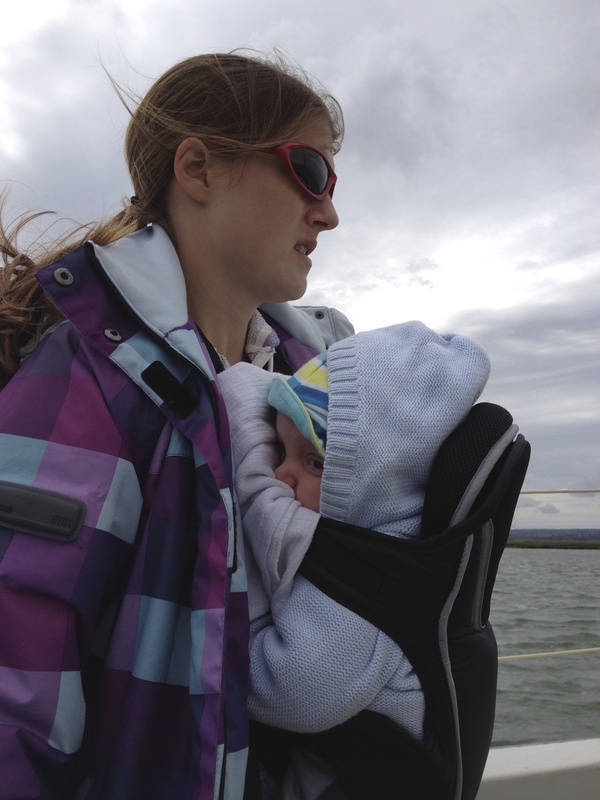 It’s as much about having them strapped onto/into something that they are not going to slide or wriggle out of and always having either the 1st mate or myself having both eyes (and usually a hand) on them. 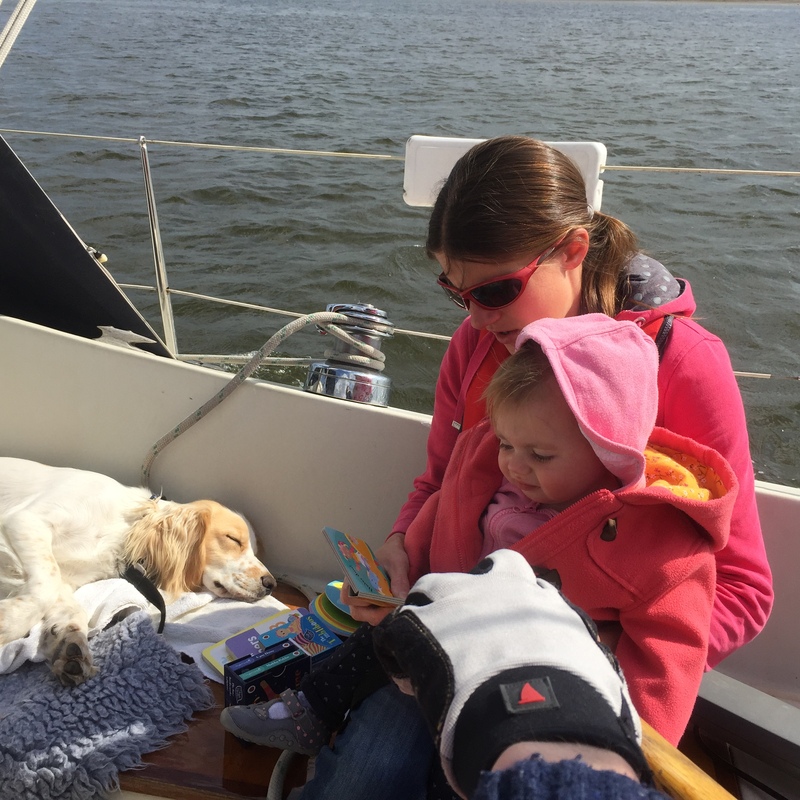 One of the most important things when setting sail with children is to have a safe place to put them to nap or be out of the way. The best and most cost effective thing (as you will already own it) for this is usually the same car seat you use for your car. 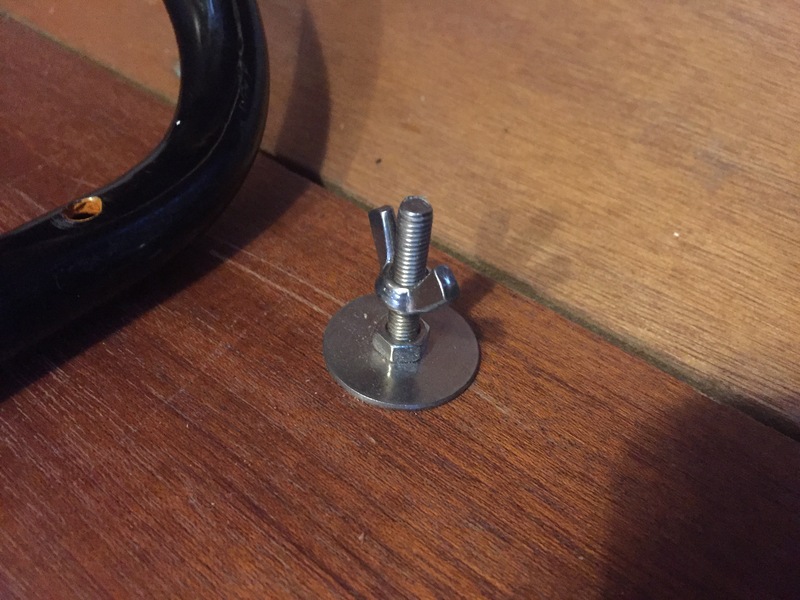 We took a standard push chair attachment for the Maxi-cosi car seat (that cost about £15), used an angle grinder to cut the push chair attachment off the bottom of it, drilled three holes in it, and bolted it onto starboard saloon berth top. 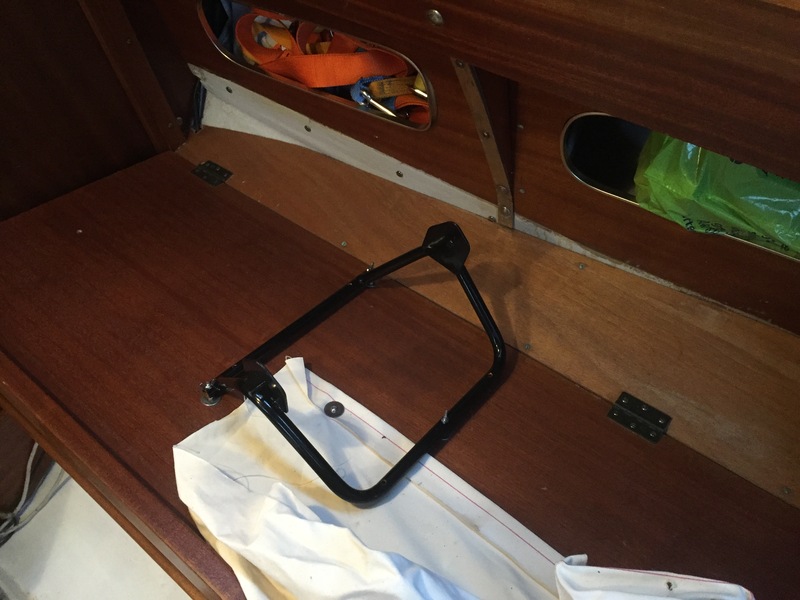 Even without the clip on adapter, the Maxi-Cosi can be wedged pretty effectively in any given cubby hole, such as the pilot berth wedged in with various bags as pictured below before we manufactured our clip on adapter for the saloon berth. In hindsight, whilst this approach worked for us, the ISOFix approach below proved to be a more robust car seat solution. 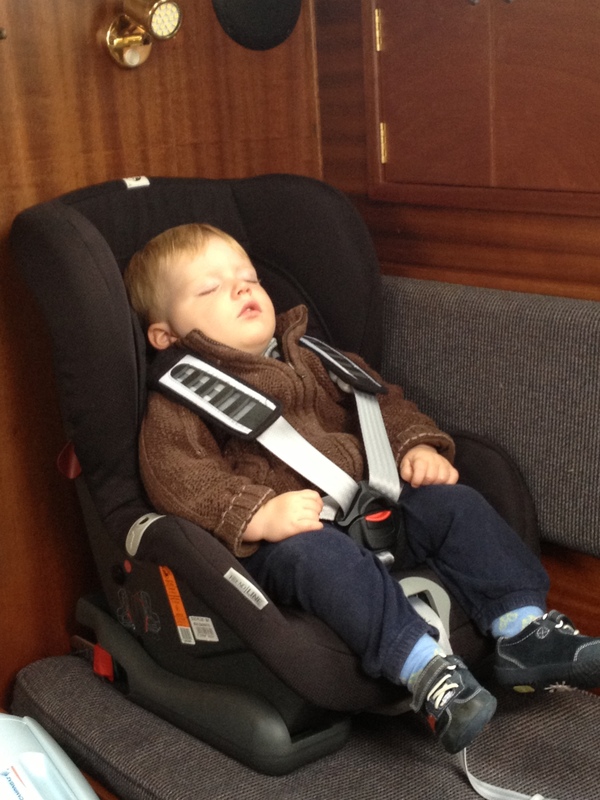 When Thomas grew out of his Maxi-cosi car seat, we knew we needed to find a way of strapping him securely into the boat and use his new ISOFix car seat. 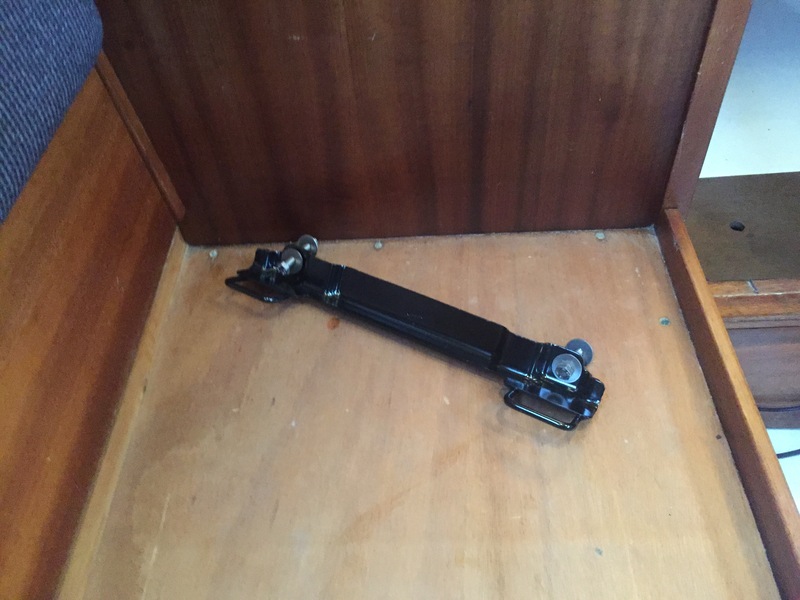 From eBay we purchased the ISOFix frame for a Ford Mondeo new for about £15 and bolted this directly to the starboard saloon seat. The berth cushion compressed enough for us to easily be able to install the car seat on that side and remove it when not in use. 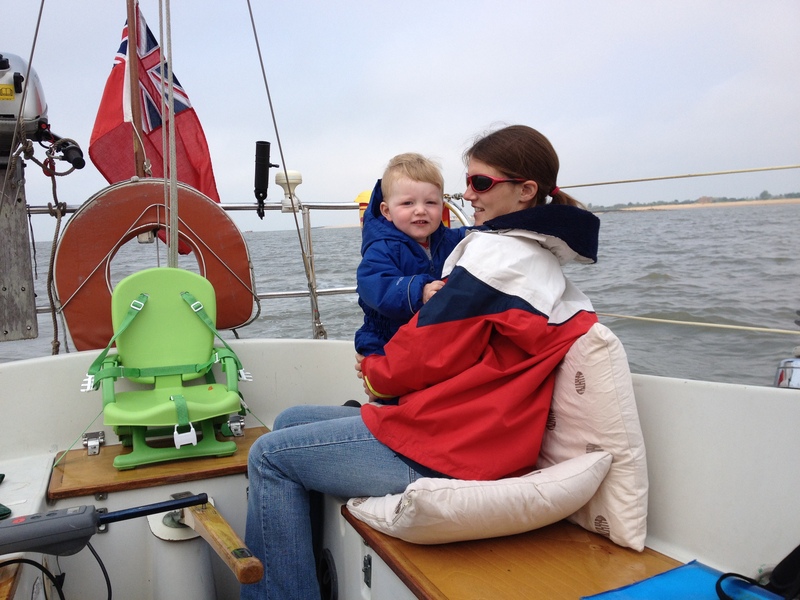 This seat has been invaluable for both Thomas and Sophie to provide a place they can feel secure and safe to nap even when the boat is leaning over on the wind or crashing through chop. 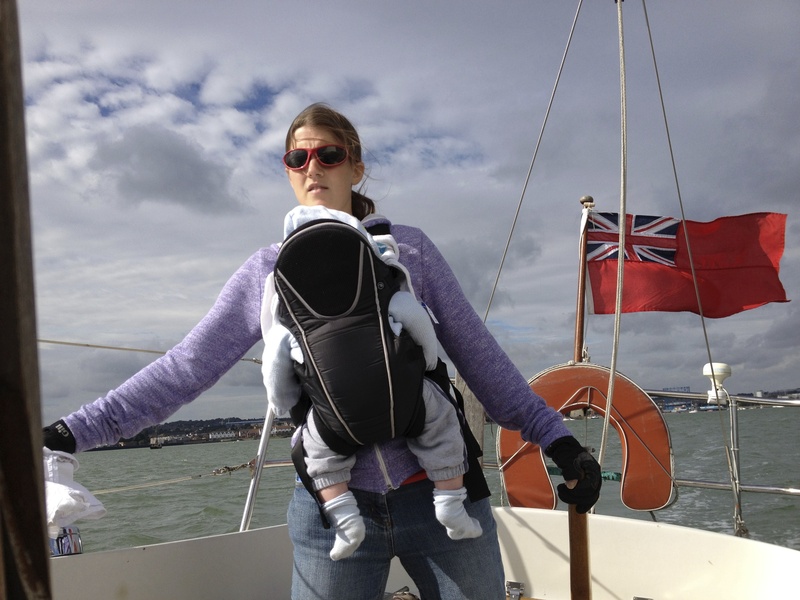 It is also useful when I need Liz for mooring up as they can be strapped in to get them out of the way. Both Thomas and Sophie have always seemed to have an innate understanding of when something important is underway such as mooring, locking in or reefing and they tend to just peer out of their car seat calmly without making a fuss or questioning why they have been dumped in the car seat. 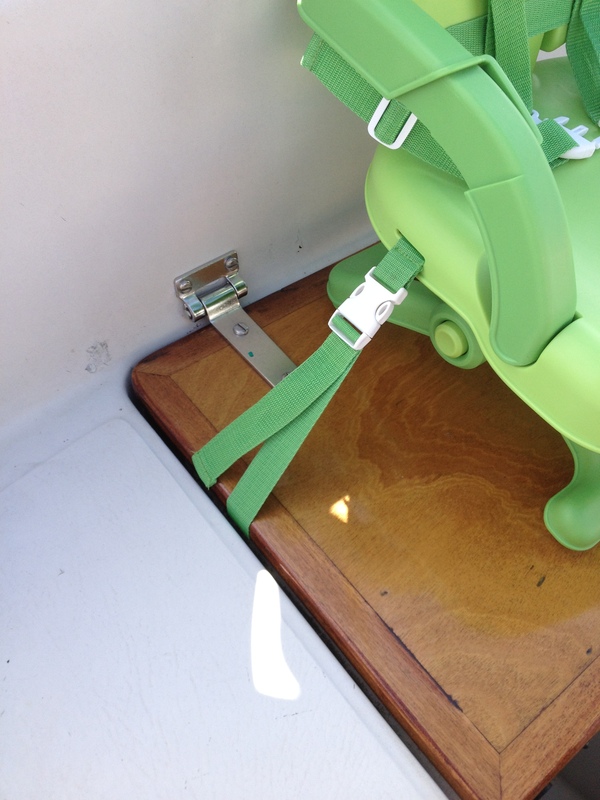 The ISOFix system will work for most car seats and bases these days and is an effective and safe way of attaching your car based system into your boat. In order to fit it, unpack your Ford Mondeo ISOFix and discard the bolts that come packed with it (these are designed to fix it to a car), choose two beefy bolts with wide washers to distribute the load. 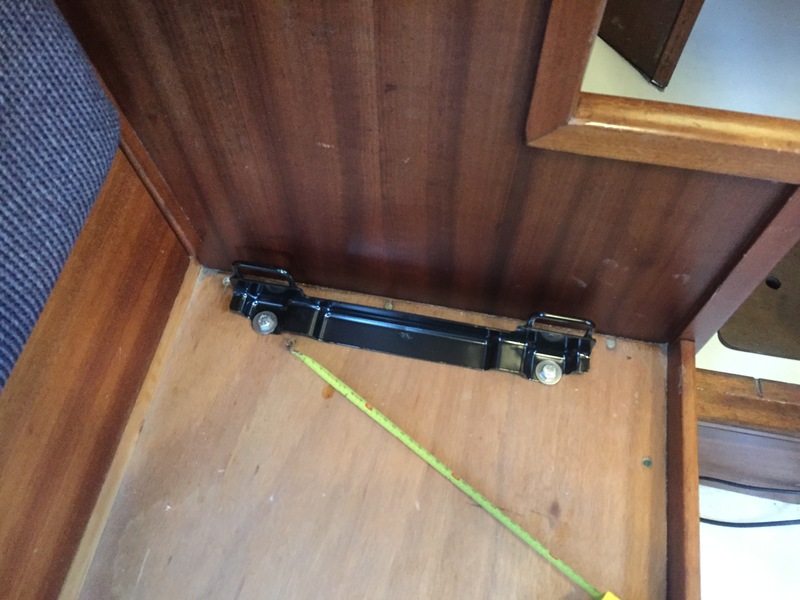 Measure out from the bulkhead it will ‘back up’ against by around 5cm and measure out about 8cm from the saloon seat back to give enough space for the car seat and mark your holes before drilling them out. 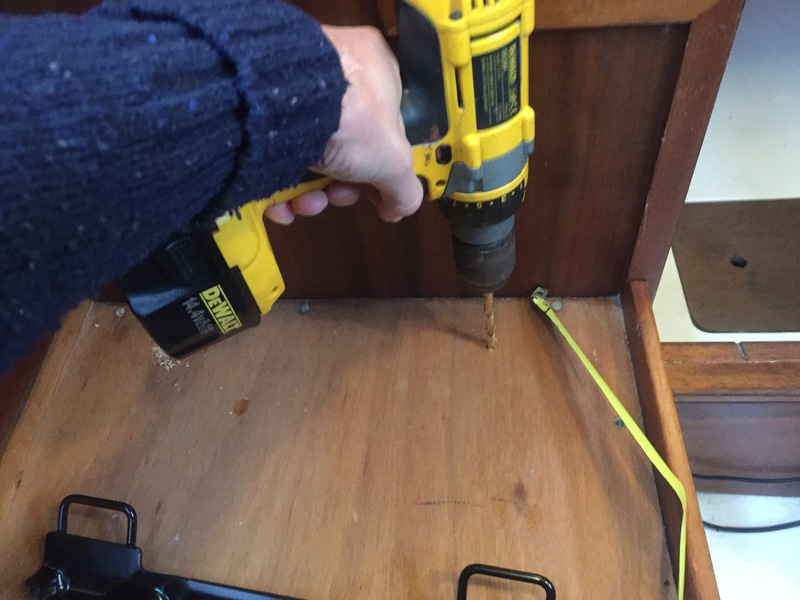 Finally, fix into place using Locktite on the nut – remember your offspring’s weight in potentially choppy conditions will be reliant on these bolts and the infrastructure of your boat where you bolt this system on, so make sure it is all sound and torqued up well. 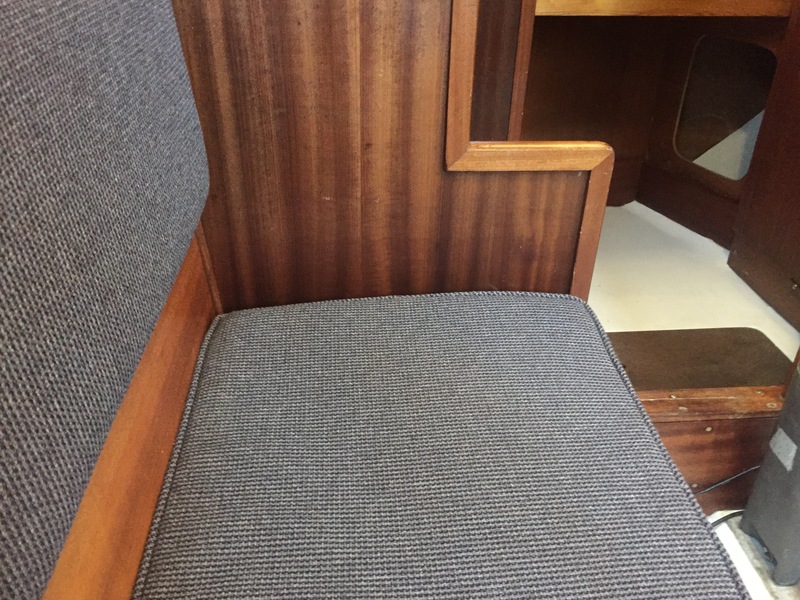 Put the upholstery back in place and hopefully it will not notice or get in the way all that much – ours doesn’t notice at all! 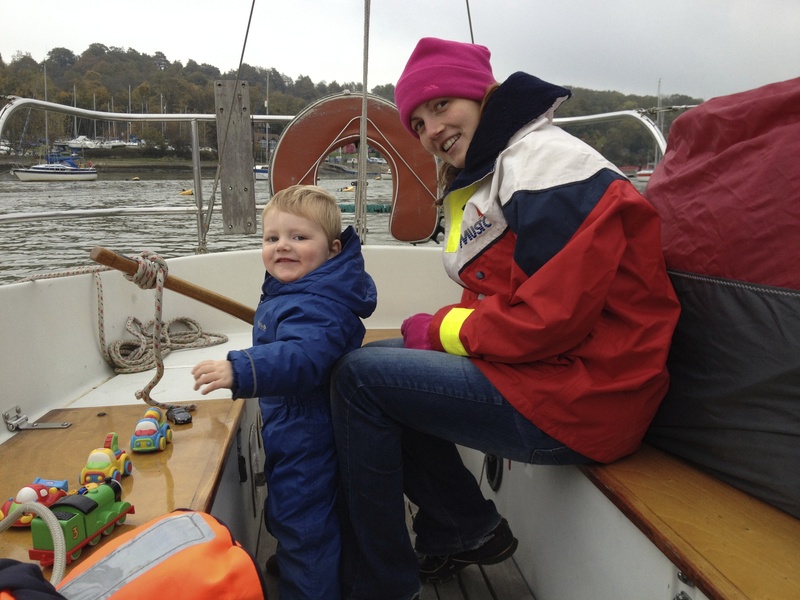 Once again, I stress, these ISOFix systems are not designed with boats in mind, so use at your own risk – it has worked spectacularly well for us though. Both Thomas and Sophie were far happier being carried around in a front carrier than being clipped in or placed down. On the boat we found that the carrier was essential as its the only way (other then when the baby is napping in their car seat) that the crew member responsible for the kiddies can have their hands free to steer and move around the boat whilst knowing the child is completely safe and happy. 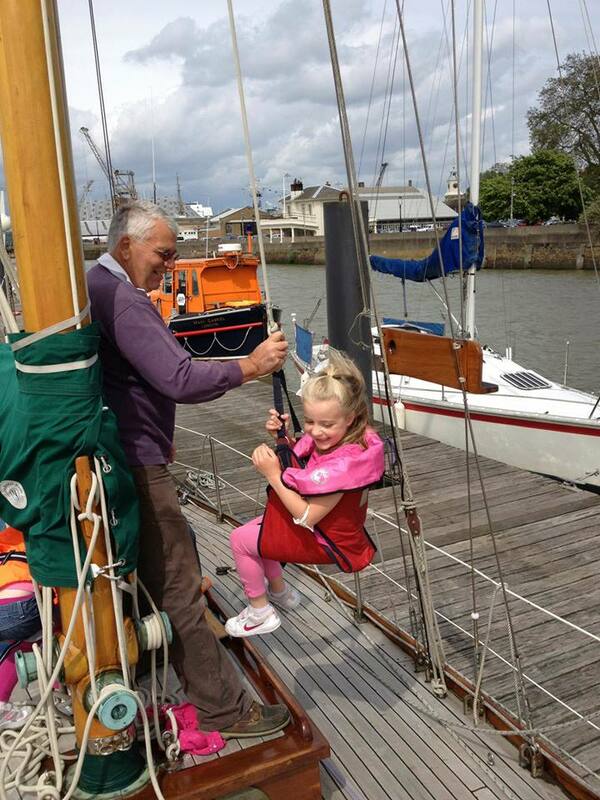 Its important to note that it is nearly impossible, and likely pretty dangerous, to have either yourself or your child in any form of life jacket whilst strapped together, so the best thing to do is to be clipped on deep in the cockpit. It would also be very dangerous doing any physical work such as winching or pulling up sails and it goes without saying you need to be exceedingly careful when moving about in the proximity of other crew members and rigging items likely to fly around such as the boom. 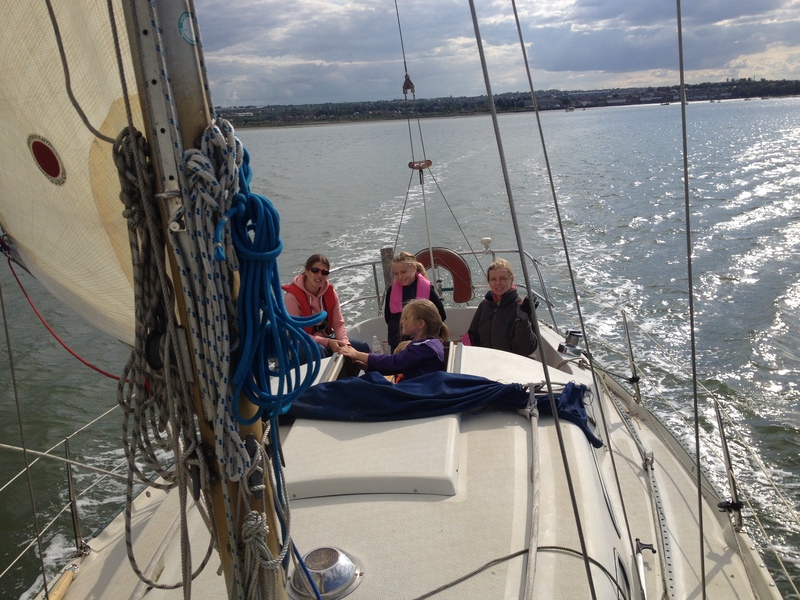 We found that being on the helm was ideal for this in light to moderate conditions. 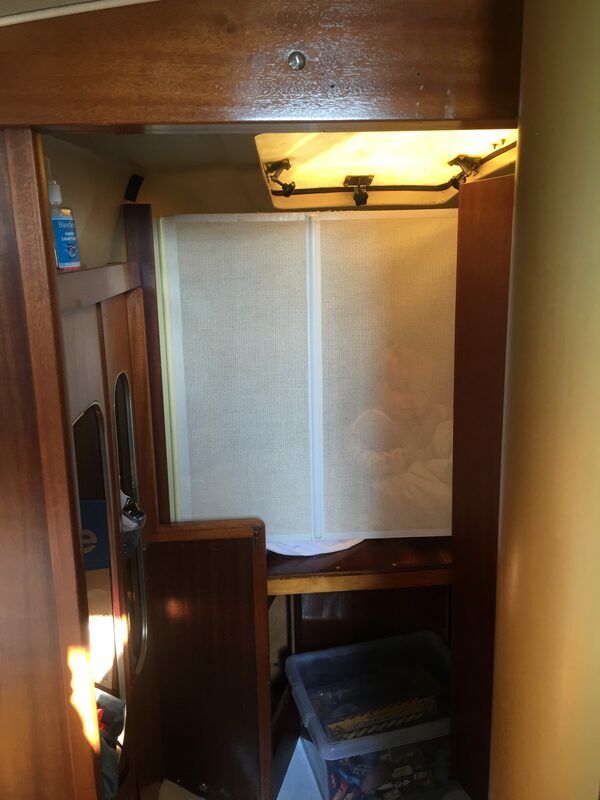 When the children are very tiny, its useful to have somewhere they can be fully enclosed so they feel secure and can’t go rolling off onto the saloon sole when they sleep. 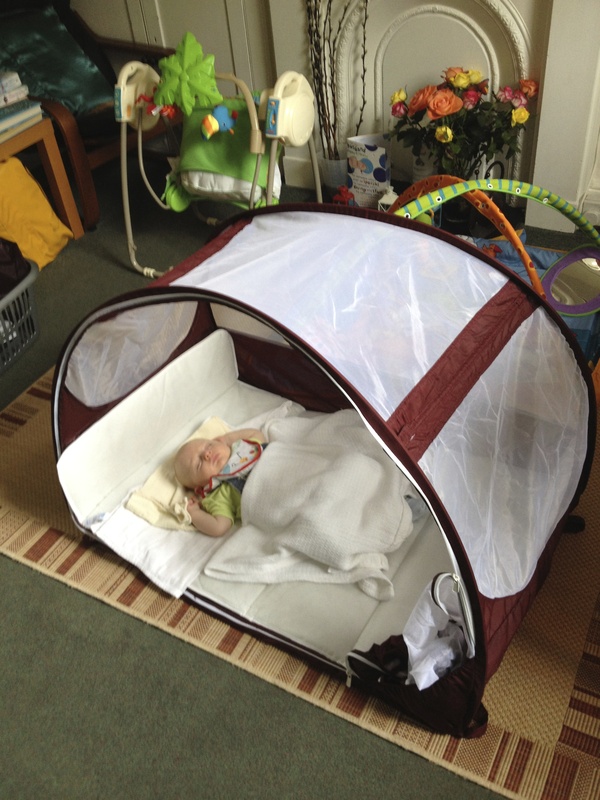 When Thomas was this small (and Sophie had yet to come along) Liz and me slept in the forecabin whilst Thomas slept in the main saloon in his Koo-di pop up travel cot, which is clever little contraption based on pop up tent technology. It was a great success and even sported a mosquito net across its entrance. 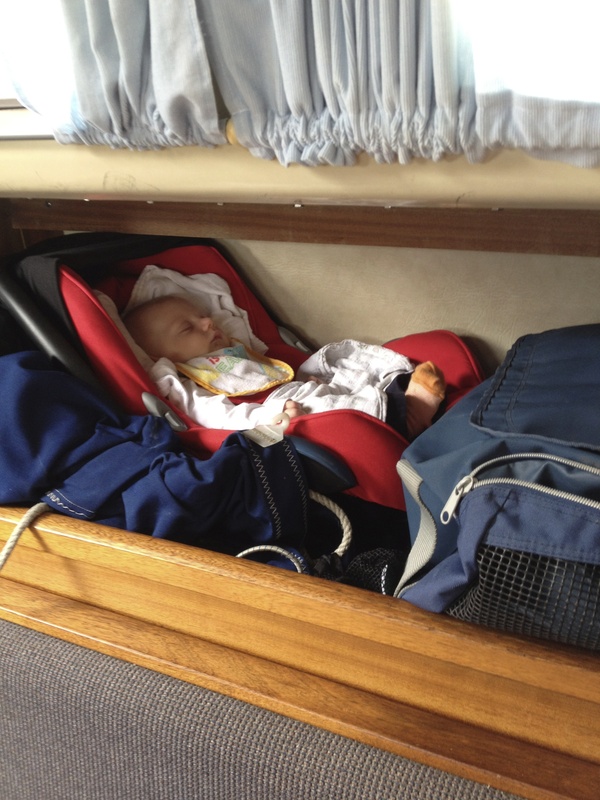 …inside Thomas is snug in his cot. 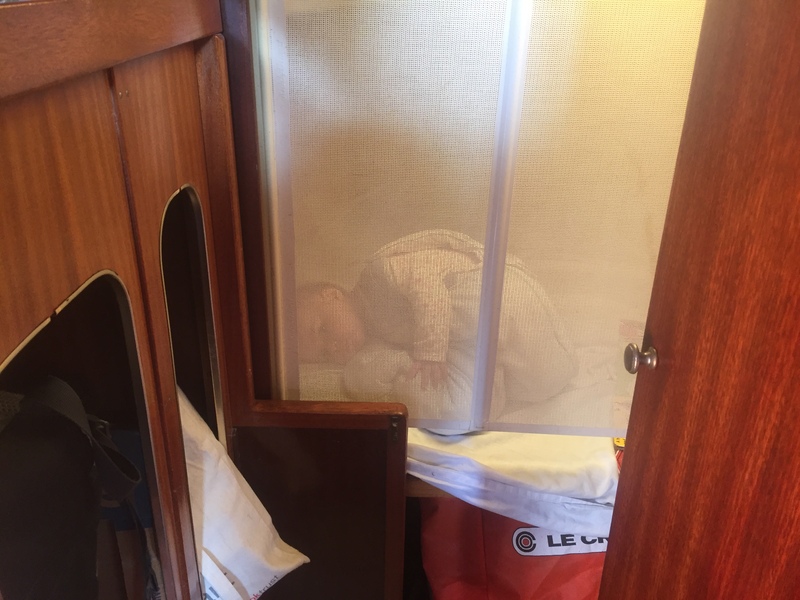 In a new exciting place (such as the boat), before they go to sleep, babies they will often attempt to throw themselves out of whatever bed or cot they find themselves in whilst wailing alarmingly. 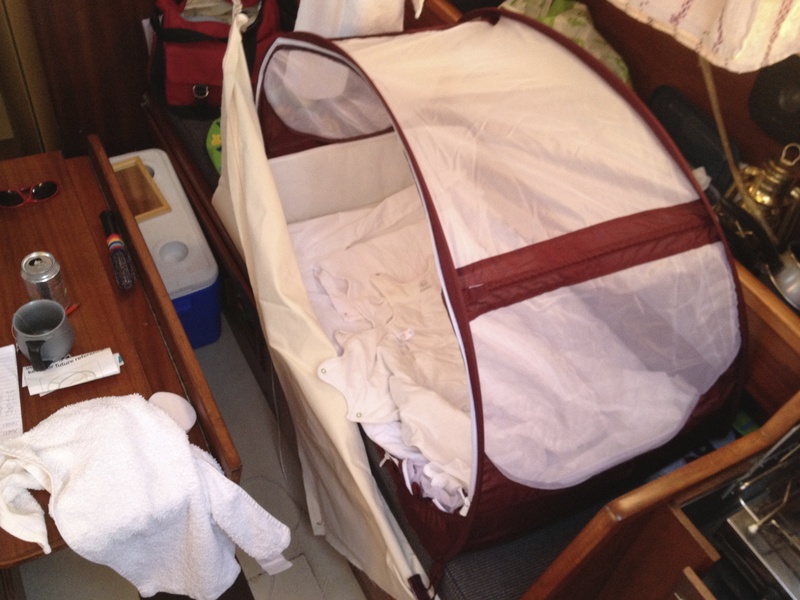 Once Thomas grew out of the Koo-di pop up travel cot, I initially rigged a lee cloth across the whole of the forecabin to make that into a safe ‘cot’ zone. 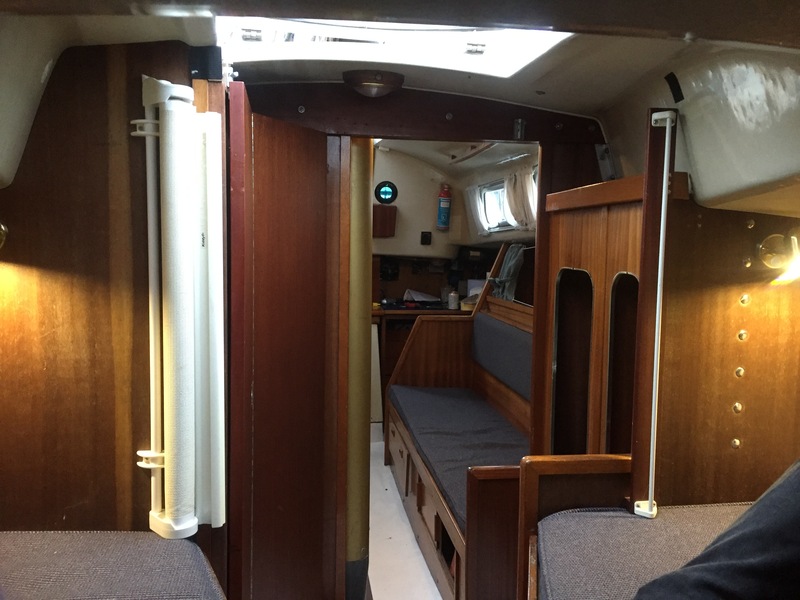 This was done by bolting canvas purchased on eBay to the forecabin bunk and then running it aft to two hooks on the bulkheads. Whilst this was actually very successful once the critter was finally asleep, I was terrified he was going to rail so hard on the lee cloth it would break and he would come toppling down onto the forecabin sole. This meant when Thomas did he usual five minute wail before sleeping, Liz or me would be dashing back and forth to make sure he wasn’t doing a dive out of his ‘cot’, which in turn led to him not actually sleeping at all as we kept dashing back and forth. Thomas escaping the lee cloth! When we had Sophie, we decided to change this arrangement and take an old Lascal Kiddyguard retractable stairgate my sister had in her garage and rig that between the bulkheads of the forecabin. 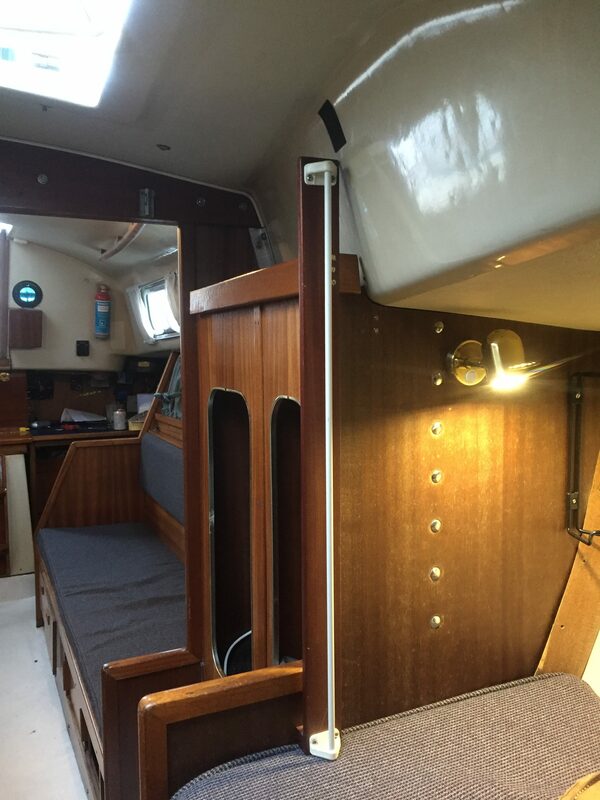 As you can see in the above picture, the bulkhead on the port side is a bit low, so we had to make a piece of wood up to give the height to affix the stair gate to. It is completely see through from the inside, so they can see you perfectly well whilst being completely protected from diving out. On the times we have used this, Sophie has been asleep within five minutes every time and its been stress free for us knowing she can’t make a daring escape. 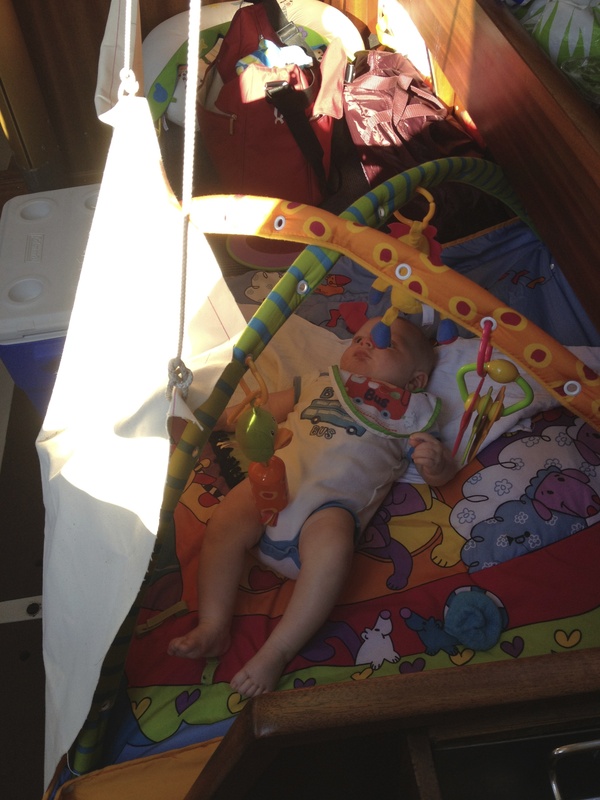 One challenge with using the forecabin as a cot at an anchorage is if you are making an early get away from said anchorage, hoping to make some way whilst the kiddies are asleep, all the clattering of the chain into the chain locker is sure to wake up and alarm your child and result in a fair amount of wailing! 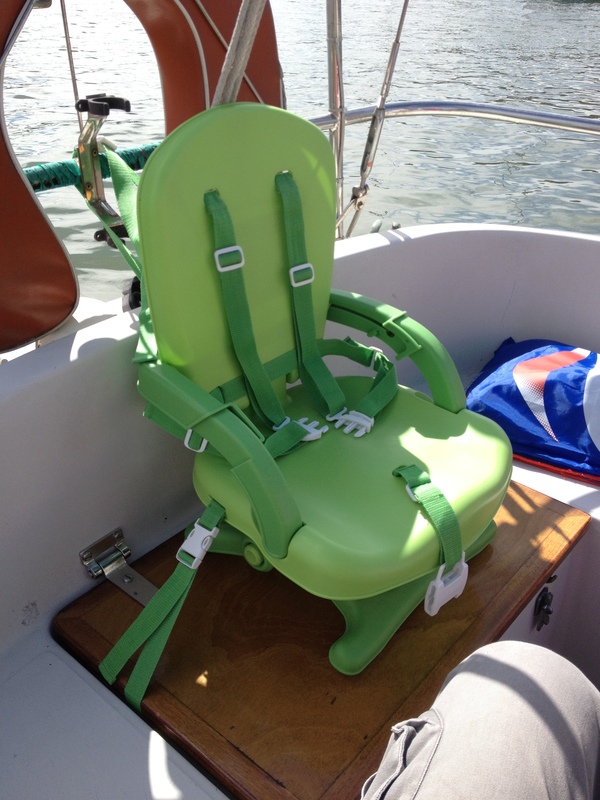 Once your baby begins to eat food they will need a high chair and the chances are you can’t fit a normal full sized high chair into your boats saloon, let alone stow it. With Thomas we struggled with feeding him while he sat on our lap, which never ended well as most of his food ended up on us or the berth cushions. 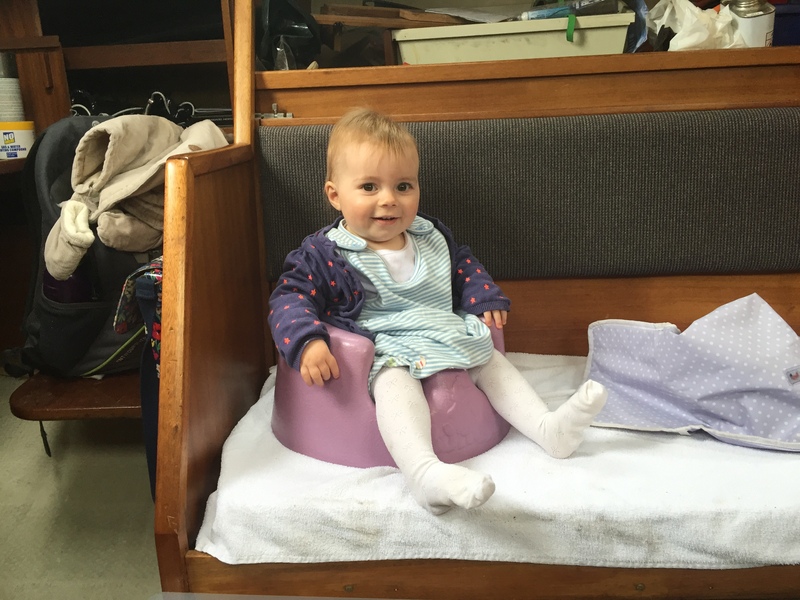 With Sophie we used a Bumbo as a highchair and it has been a complete life saver. It means you can feed your child successfully and manage to eat your own meal at the same time. We put the Bumbo on the berth cushion next to us with a towel underneath it to catch any flying food that Sophie pings around. A word of warning, the Bumbo expressly states (in very large, alarming warnings stuck all over it) it should never be used at any height as the child can wiggle free from it and leap out to freedom (and in some cases free-fall), so do use this at your own peril and with someone with a hand on the child, or very close by, at all times. 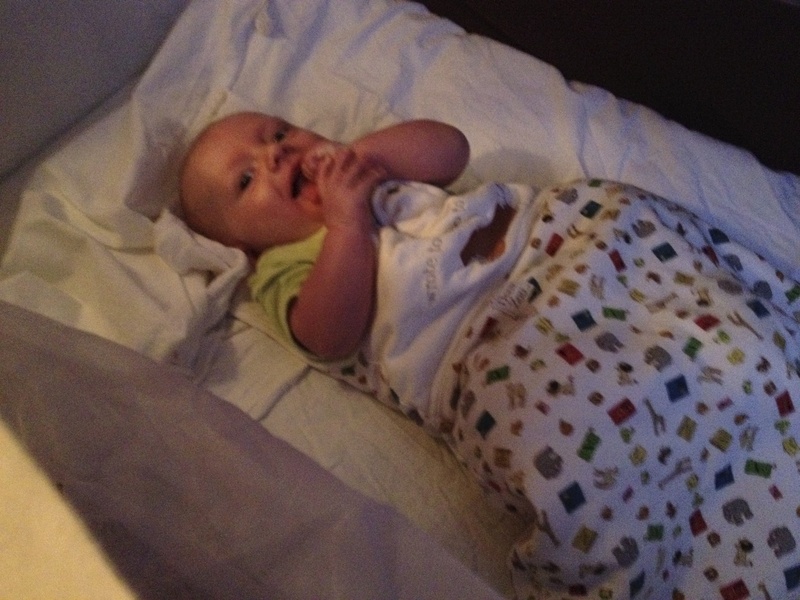 The Bumbo is a far better solution than the feeding pillow we routinely propped Thomas up with when he was little. 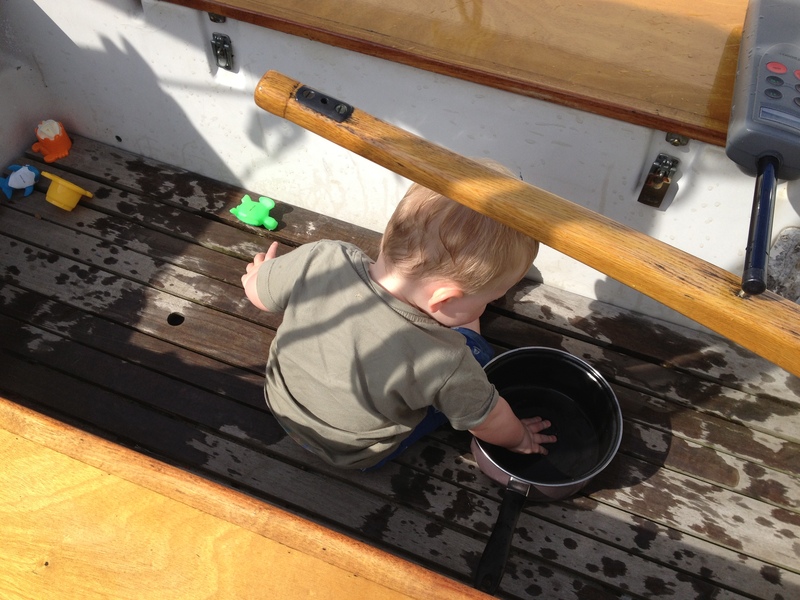 We initially bathed Thomas in the galley bowl when he was tiny. We soon upgraded to an inflatable bath as he grew. 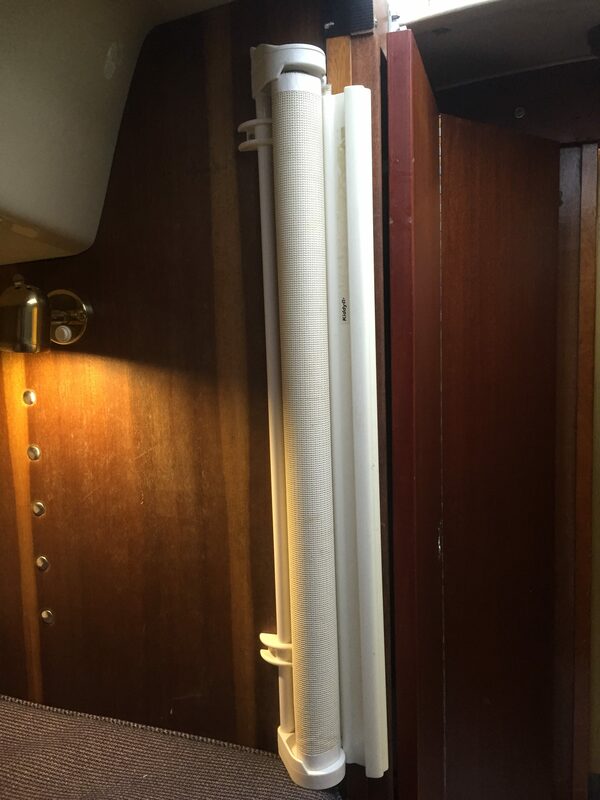 It was very easy to stow, it didn’t use as much water as you might think, and it was great for using the remaining water to clean out your bilges with too! Since we have had two we have become more lazy and sought out marinas and taken them in the showers with us rather than go to the effort of blowing the bath up! I wanted a way for Thomas to be in the cockpit, able to look out, be involved and see what was going on, whilst being secured by a five point harness system. 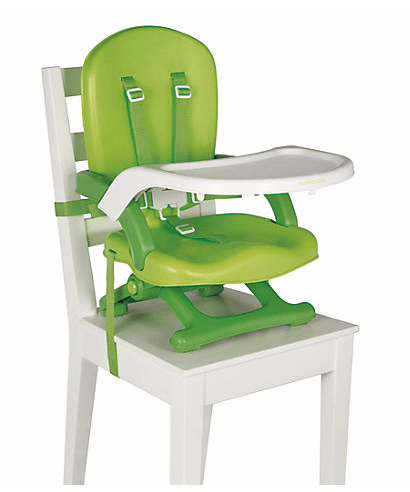 There are scant few feeding chair systems that offer all this in a package which can be easily folded away. We eventually found such a beast at Mothercare, named a Travel Folding booster chair. 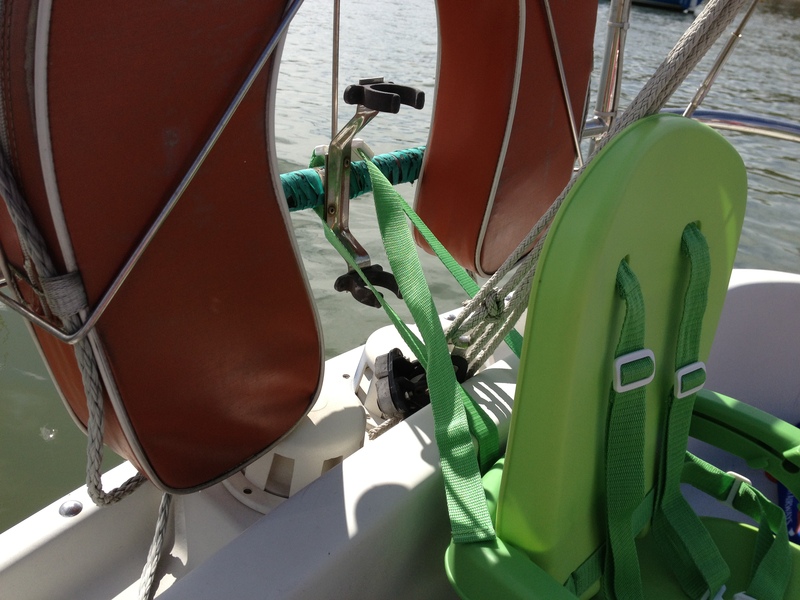 It has a little clip on table that is great for feeding your children snacks and lunch when you are underway. 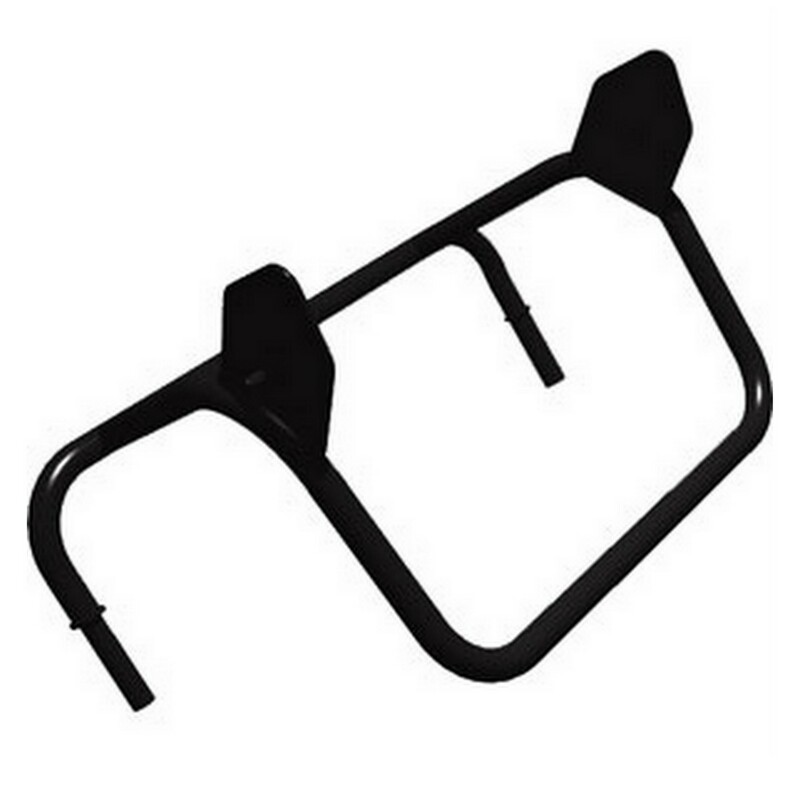 The seat fastens under the aft hatch and back to the pushpit to make it fully secure and very comfortable for short periods of time (owing to its lack of any padding). On the wind though, in anything but very light conditions it is pretty useless as the child slides uncomfortably over to one side of the chair. 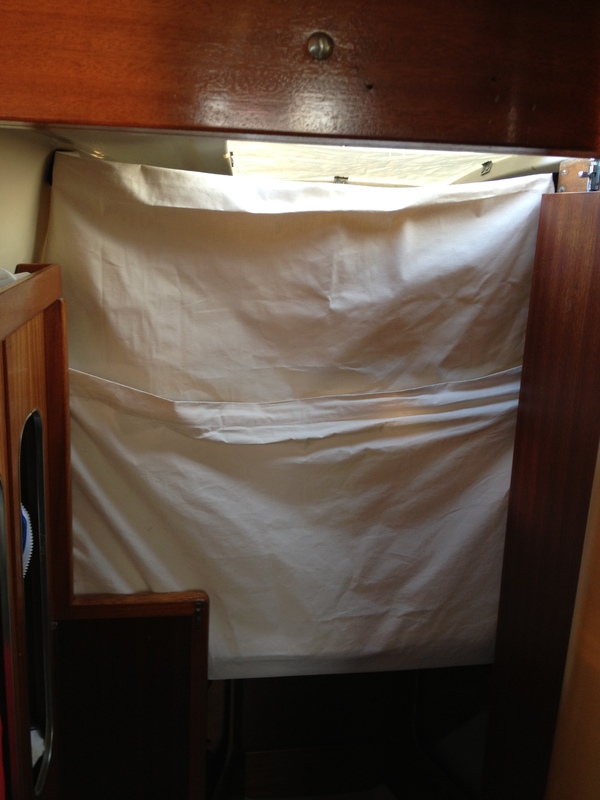 Across the starboard saloon bunk we rigged a lee cloth for two reasons. 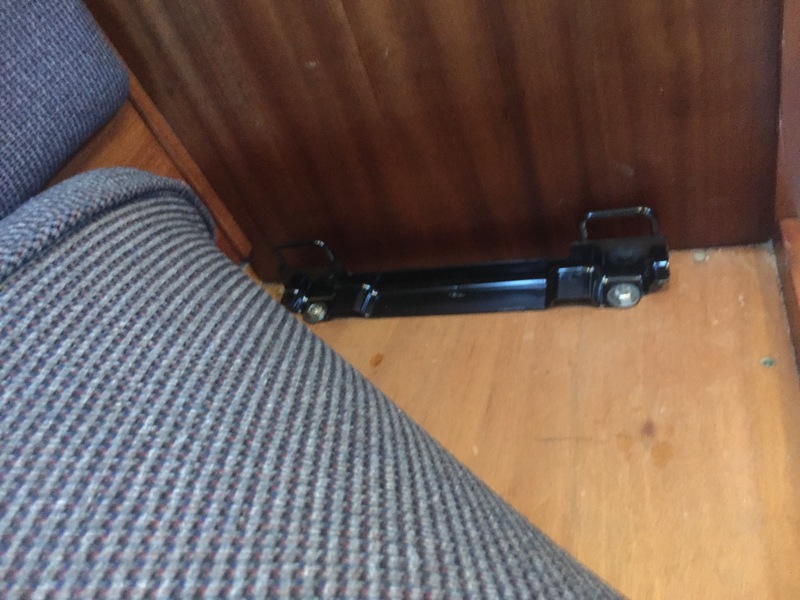 The first being to stop the Koo-di travel cot from capsizing off the bunk onto the saloon sole when Thomas slept and the second to allow the area once the travel cot was down to act as a safe play zone for Thomas. It fitted Thomas’s baby gym mat which worked well as then he had a space to happily play out of the car seat or baby carrier. I used to be a purist. No TVs on boats, just the sound of the birds, the water lapping on the hull, a good book and perhaps an engaging and intellectually stimulating game of Pass the Pigs. 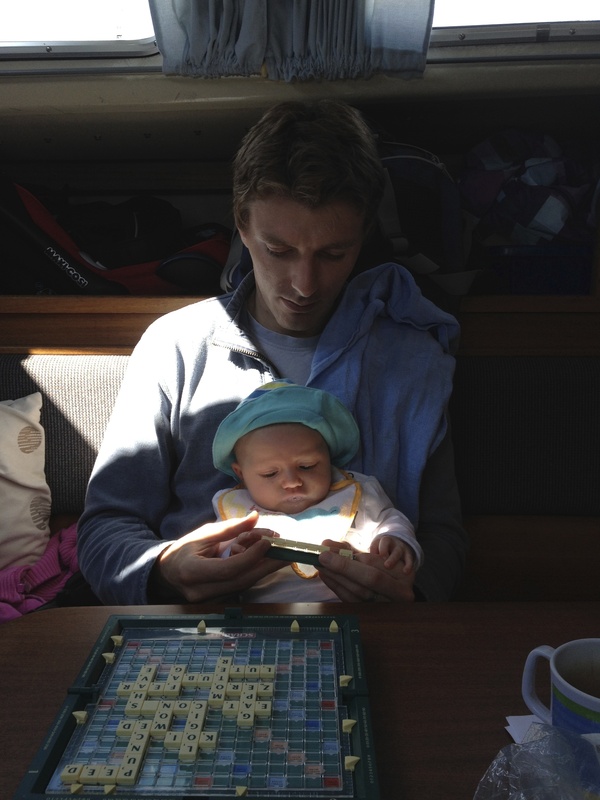 With the addition of children and doing anything but trivial sailing, forget it. 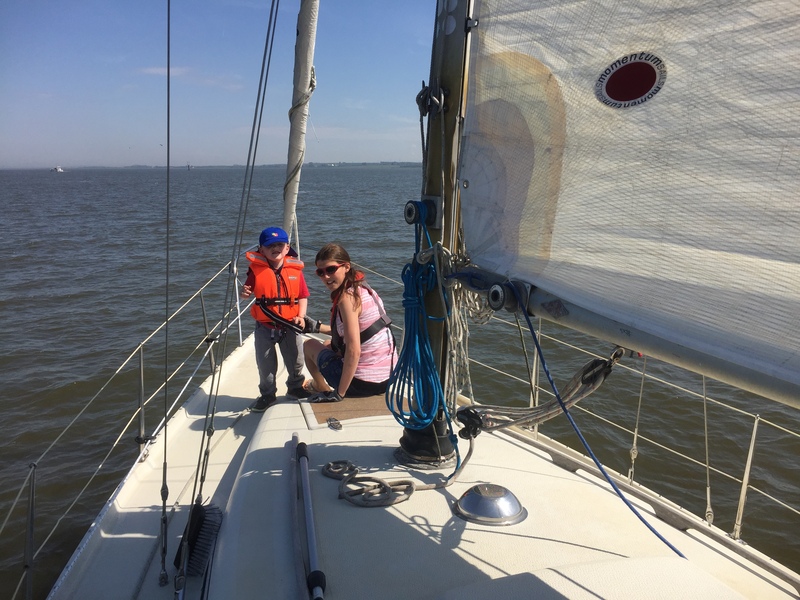 In order to entertain the little critters after the initial concentration span on the actual sailing has run out (which normally lasts about an hour for every year old they are if you are lucky), you will try just about anything. Every child is different of course, and what entertains them will vary greatly dependent upon your child. 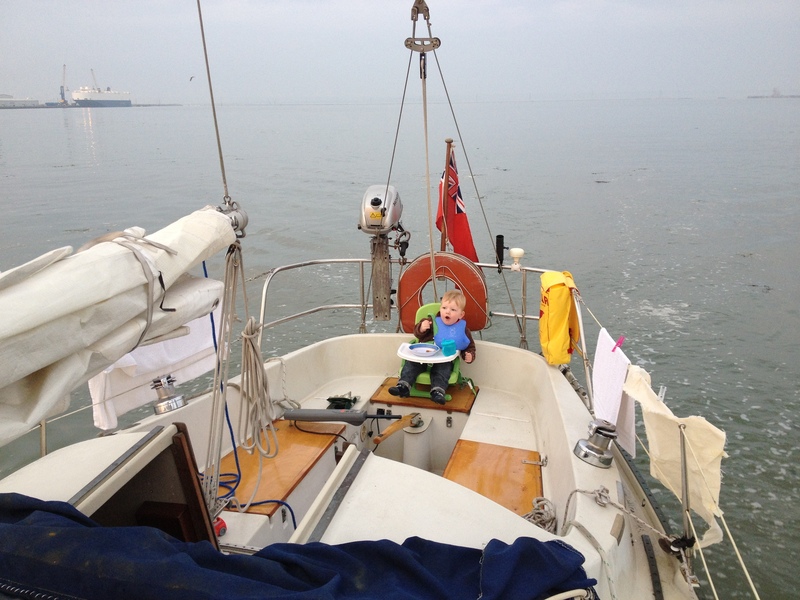 Cbeebies/childrens DVDs – Be it on tablet, iPhone, laptop or TV can buy you precious minutes to put the mainsail cover on, cook dinner or just have a cup of tea. 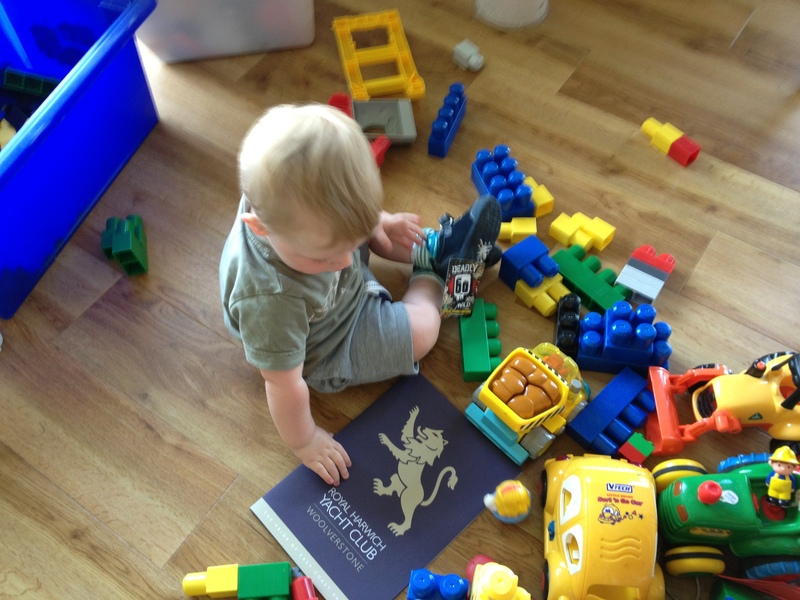 Books, magazines and sticker books are a great way to keep the children entertained. Sophie enjoying a questionable publication! Boat friendly toys. 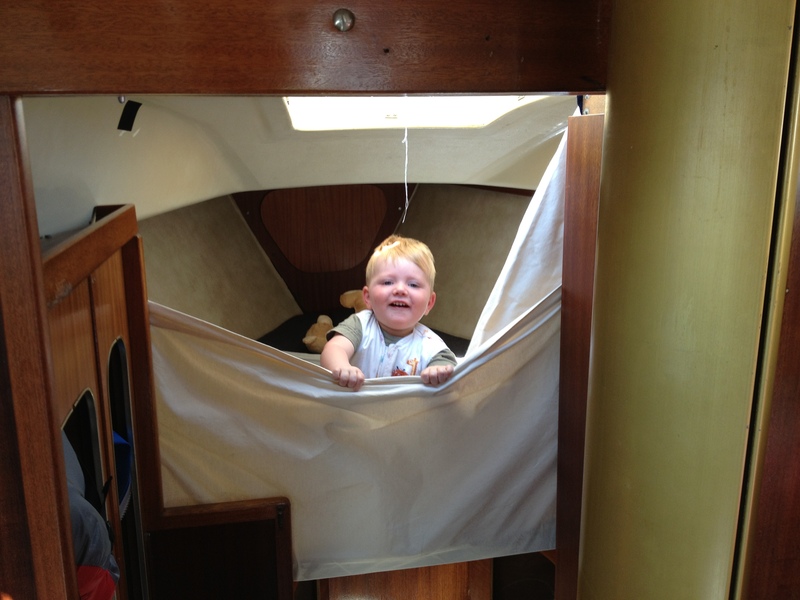 Thomas has a whole box of ‘boat cars’ that he only plays with on Triola – the boat having lots of car friendly surfaces at the right height, such as cockpit lockers and saloon berths, help. Who needs a gym mat? Drawer number three! – This is stuffed full of various sugary junk that is usually rationed or banned altogether at home. Different rules apply on board! 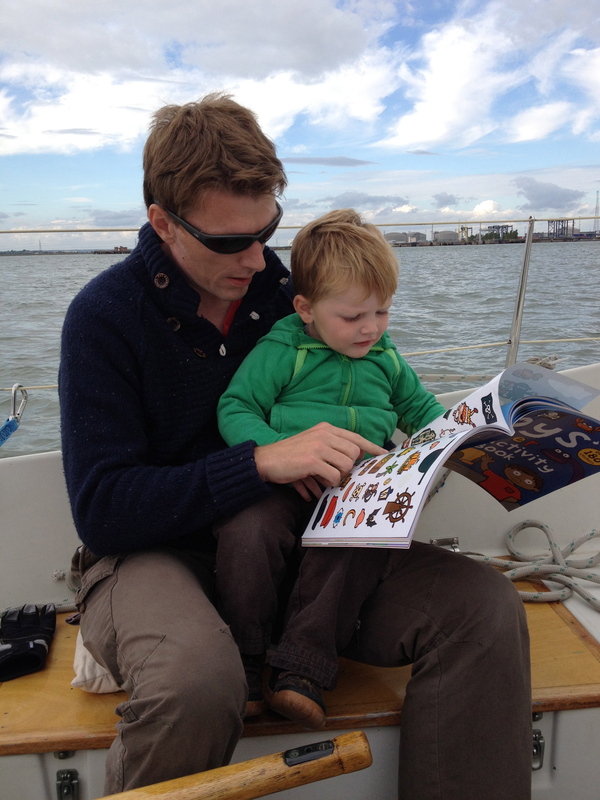 We find that having special ‘boat toys’ and ‘boat books’ that only live on the boat helps as for one, we don’t have to lug them back and forth from home, and for two, they are fresh and exciting every time the kiddies get down to the boat. 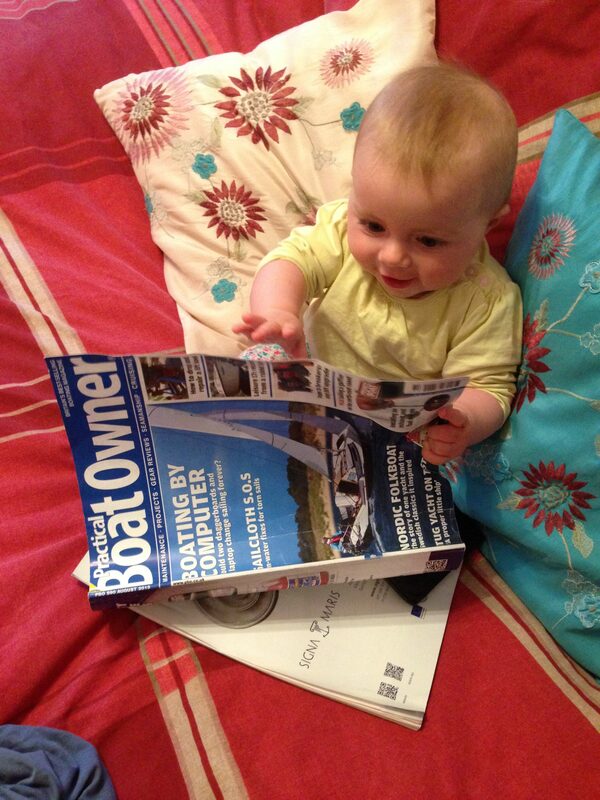 There are many other ways of entertaining your children on your boat. 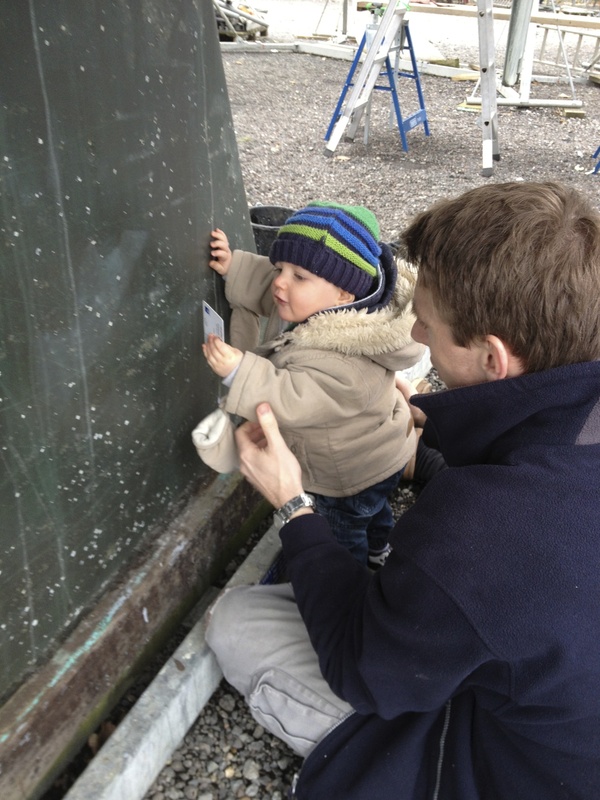 As soon as they are old enough, get them involved and give them meaningful things to do, be it stowing fenders, helping with maintenance (them holding a torch for you is great for this), coiling ropes or steering (the trick here being to not interfere as much as you can, regardless of how much the boat slews all over the river). There is always something for little hands to do (and if you don’t give them something to do, they’ll find their own mischief!). 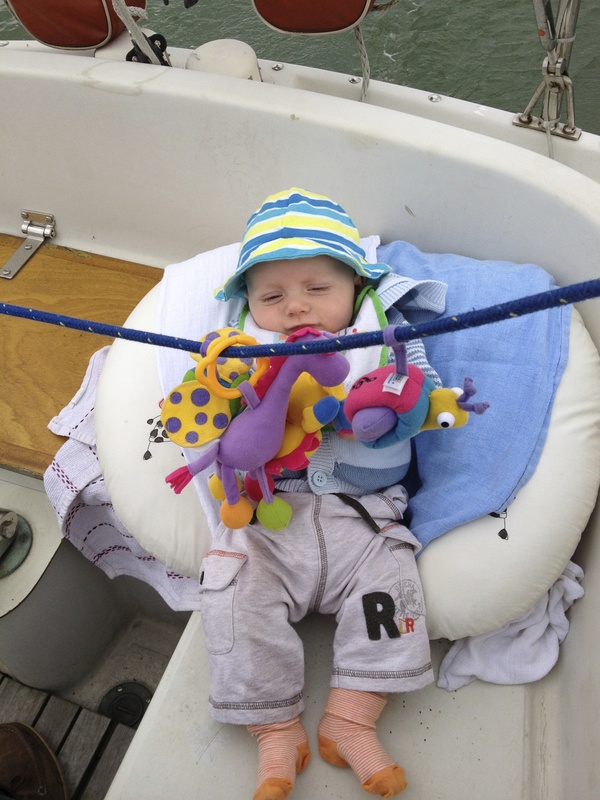 Chandlers and marinas are not the best equipped places to cater for your pint sized crew members. We struggled to find basics such as nappies, wipes, baby food and the other required paraphernalia that small children need in the places we visited. We found it best to stock up with these items before setting off. I yearn to sit in quiet and secluded anchorages, with nothing but birds, and perhaps a choppy dinghy ride and a muddy trudge up to a friendly pub. We still do these things, but we usually regret it when we do! Marinas with kids are a god send: The ability to get off, wander around, find coffee shops with toys in and local chandlers to terrorise makes the whole experience far more pleasant for all concerned. 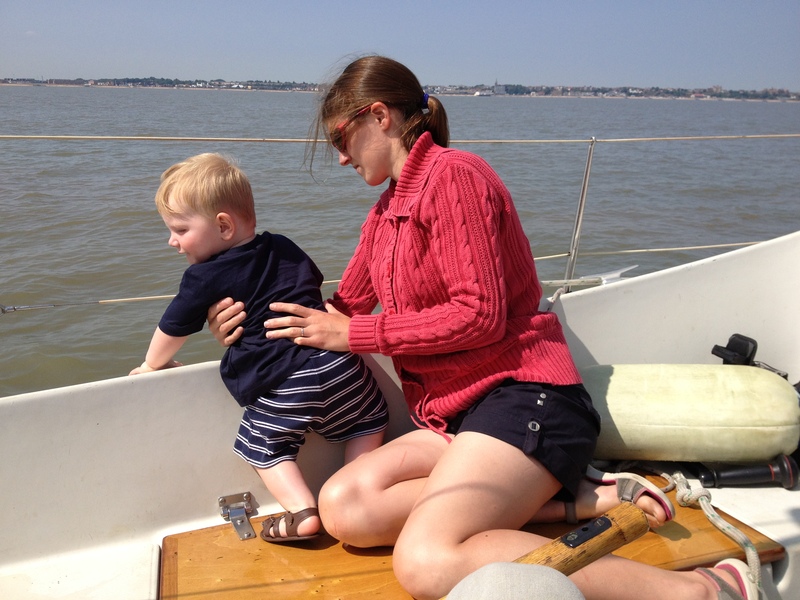 On one of our previous sailing adventures when Thomas was very little, we were having a cracking sailing short tacking up the Medway, crashing through the chop. 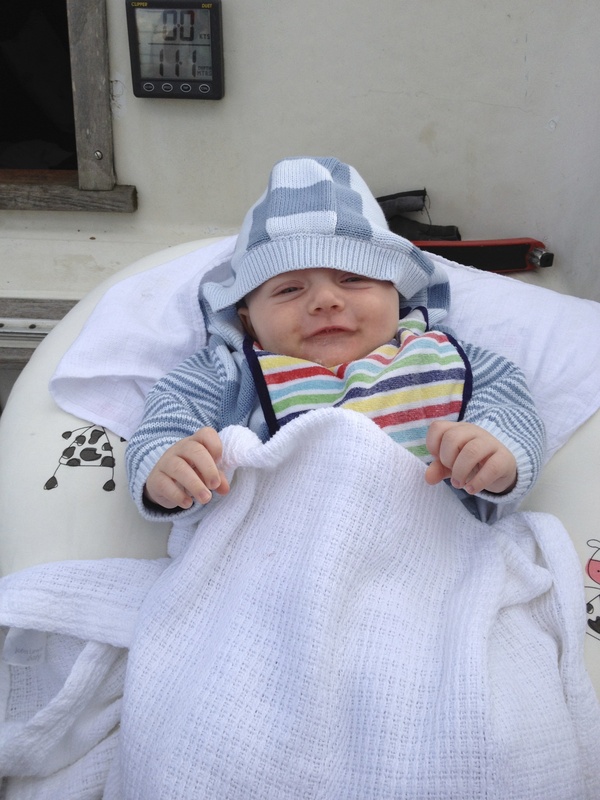 Thomas had just had his lunch and Liz asked me to make the boat ‘Stop’ as she was ready to put him down to sleep so she could come up and enjoy the fun. 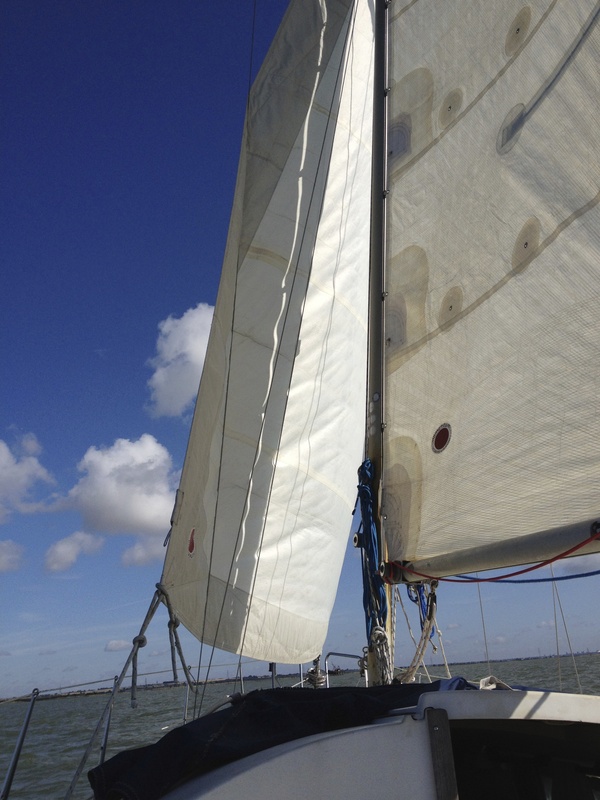 Short of motoring into the wind and letting the sails flog, or turning around and flying down wind in the wrong direction, I wasn’t sure what I could do to help. Then it occurred to me – Heave to! We passed through the eye of the wind leaving the Genoa tied on the windward side, and held the helm over to push the bows into the wind and everything went calm, it felt as though the chop melted away and the wind strength dropped by half. 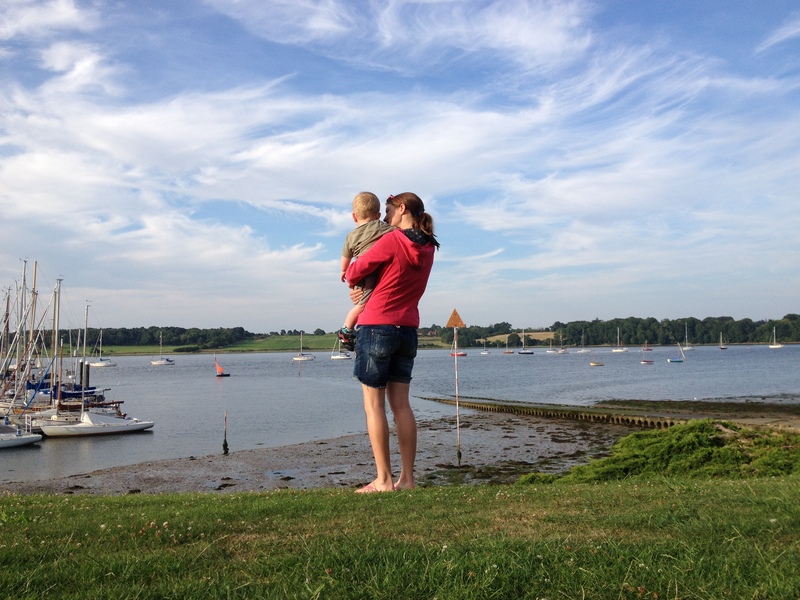 Liz got Thomas down, came up, and we continued our romp up the Medway. 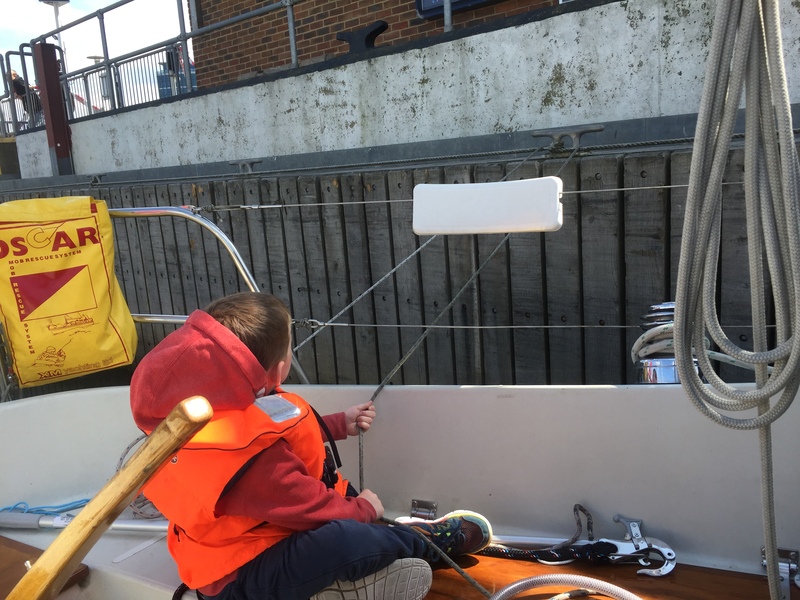 There are lots of ways of talking yourself out of taking your young children sailing and waiting until they are ‘old enough’, and I have found myself doing the same citing concerns over safety and the amount of work making the boat into an area that is safe and works for kiddies. With gentle and constant encouragement from Liz we overcame these worries and the rewards are great. 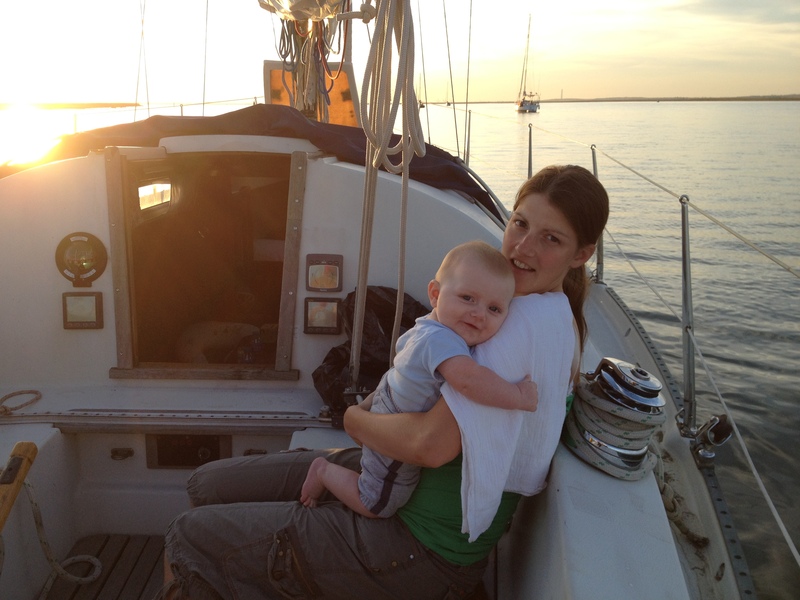 We get to continue sailing and using the boat we love, we get to spend time together as our little family unit, and it will leave the children with great memories that will stay with them forever. 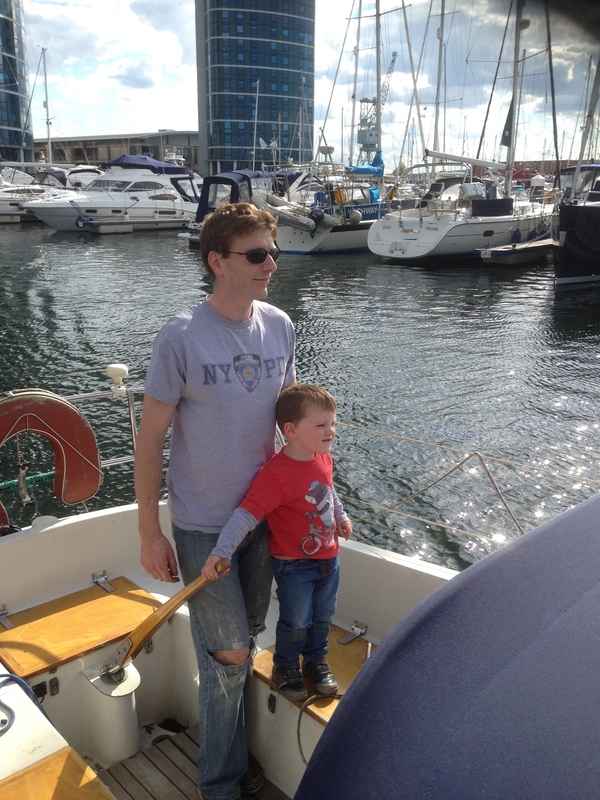 The best way to look at going away in your boat with young children is not that it is a holiday, as it is anything but relaxing for the most part, but it will certainly be an adventure for all!